6 Commercial Real Estate and Properties in Cairns are listed in 8 categories. We have 103 Retail Shops for Sale & Lease , 64 Offices for Sale & Lease , 42 Industrial Warehouses for Sale & Lease , 21 Development Lands for Sale & Lease , 5 Commercial Farms for Sale & Lease and 4 Hotels and Leisure for Sale & Lease . Leave your worries behind on this beautiful acreage property situated so very very close to Cairns is just waiting for you to move in. The 2.5 acre piece of paradise boasts a lovely tidy 3 bedroom home dotted with fruit Trees including Mangosteen, Abiu, Rambutan etc.. There is plenty of room with two sheds all under cover with power connected. There is agistment room for horses nearby and plenty of water with your own bore for that vegetable garden and grounds. This property is large enough for the kids to run free and accommodate some animals but small enough to manage comfortably. With your own electric gate and tucked in behind in a battleaxe your privacy is assured. The full length rear verandah facing west is just fantastic for afternoon drinks watching the sunset over the mountains and waving sugarcane. This property has a real serene presence about it. The peace and quiet of the grounds and area this close to Cairns are very special indeed. What a fantastic property! But don't just read about it, come and inspect today. 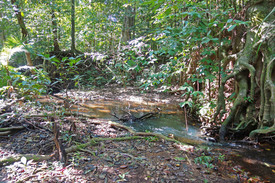 Properties like this so close to Cairns are very hard to find. We have a motivated vendor. If you miss out on this one you are going to kick yourself for years. Don't miss out again. Call me today and I will arrange your own private personal inspection. I'll put the jug on for you and bring your camera for the sunset.